Sir Jimmy said Top of the Pops "belongs to the world now"
Almost four million people tuned in to the hour-long final episode of Top of the Pops, according to unofficial overnight figures. The BBC Two programme averaged 3.9 million viewers, representing a 20.8% share of the TV audience at that time. Recent audiences averaged about one million in the Sunday slot, down from about 15 million in its 1970s heyday. 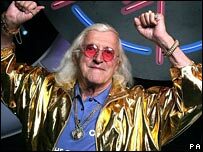 Sir Jimmy Savile returned to co-host the final show, with a programme looking back over its 42-year history. The BBC announced last month that it was axing the world's longest-running weekly music show, saying that it could not compete with 24-hour music channels. Other former presenters returned for the final episode, including Janice Long, Reggie Yates, Edith Bowman, Pat Sharp, Sarah Cawood, Rufus Hound and Tony Blackburn. Sir Jimmy, who presented the first show in 1964, was seen after the credits turning out the lights in BBC TV Centre's Studio 3. The programme counted down to the current number one, Shakira and Wyclef Jean's Hips Don't Lie.